Jerry Budyk of the Elmhurst G&CC is the inaugural recipient of the Golf Manitoba Distinguished Service Award. 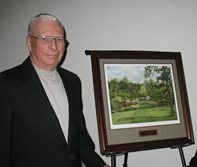 Jerry has been involved as a volunteer with amateur golf since 1982. He was an active volunteer with the former Manitoba Golf Association (MGA) and continued his dedicated service to Golf Manitoba. He has served in the capacities of club representative, as a starter and scorer at provincial championships and as the Associations coordinator of volunteers for bingos at Club Regent and McPhillips Street Station.